We wrapped up another outstanding style tour earlier this month and our minds are still spinning with all the incredible inspiration. 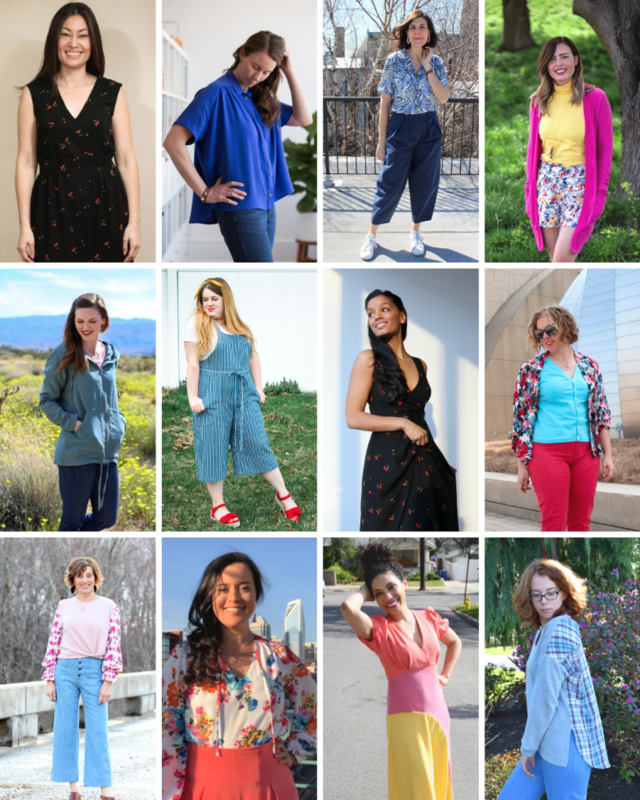 This spring’s tour was filled with an amazing mix of garments and fabrics of all types—prints to solids and dresses to pants—it really covered all aspect of spring sewing. Here is a handy reference to recap the stops with links to each post and the fabrics and patterns highlighted! 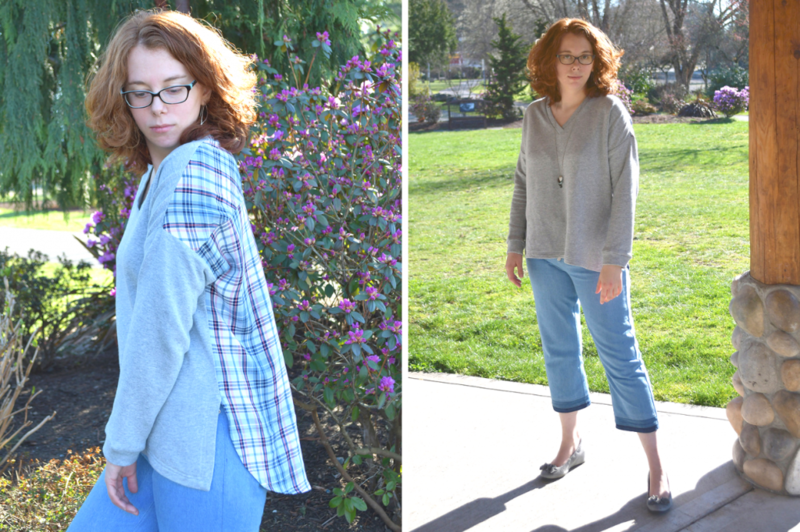 Jennifer kick things off this spring by giving us some insight into how she is working to transform her handmade wardrobe. 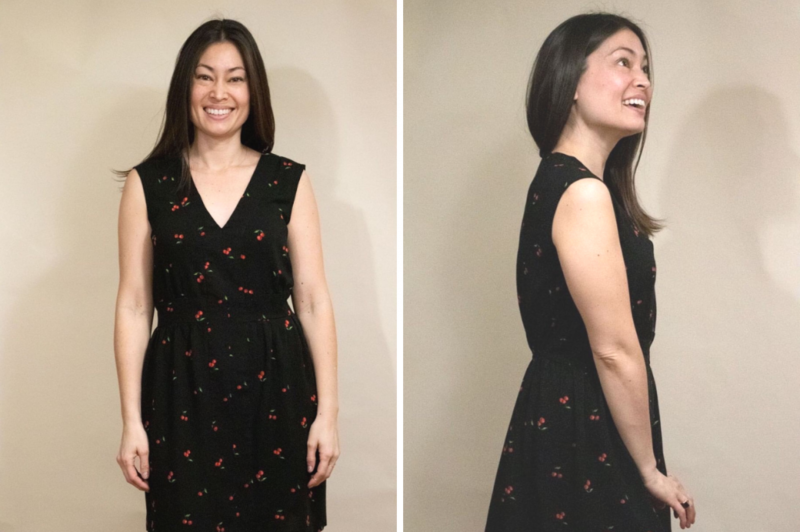 She sewed up this flattering cherry dress that she can wear and enjoy all season long! Get all the details about her fabric and pattern choices in her Instagram Story Highlight titled, “Cherry Dress”, HERE. 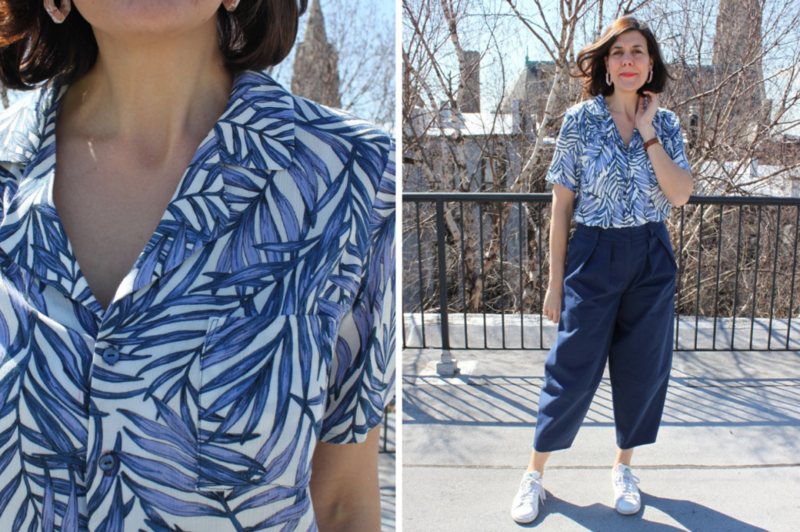 Anna sewed up two amazing piece for her spring wardrobe—an oversized button-up and matching shoulder bag. It was a pleasure having the bag-making maven herself join us for the tour this season and it is always fun to see what she sews up for herself! Learn more about both piece HERE. Charlie wowed us this this stunning tropical button-up. She took the Carolyn Pajama top pattern and turned it into a designer-worthy piece we all now want hanging in our closet. She paired it with cropped trousers in a classic navy, a piece that is sure to become a new wardrobe staple. Find out more HERE. Elizabeth kick thing up in the color department with her spring-worthy outfit! She combined an amazing group of colors and textures to create three pieces that not only look great together, they will also be great outfit building pieces for this season. Get all the details about all three HERE. Day 5 — Alina Design Co.
Our Spring Style Tour gave Alina the “excuse” she needed to finally sew a Joy Jacket of her own! 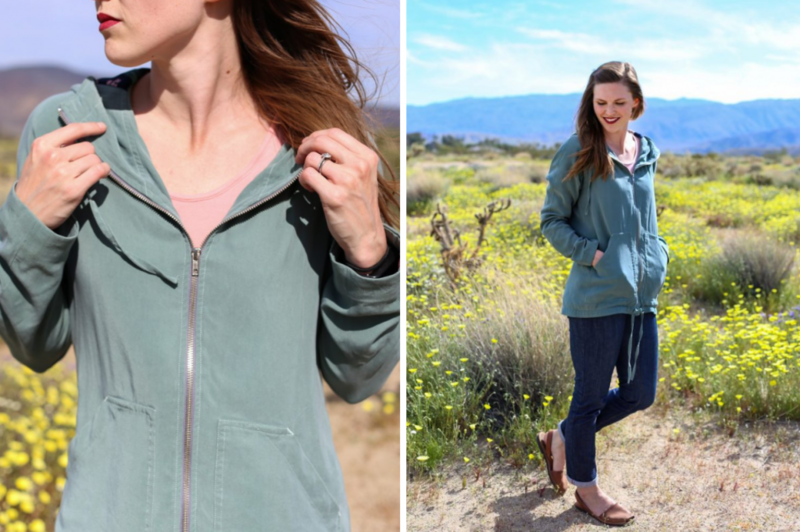 She used a soft tencel twill to create the perfect spring jacket in a color she can pair with everything in her handmade wardrobe. Check out lots of her other recommendation and see more of her stunning photos HERE. 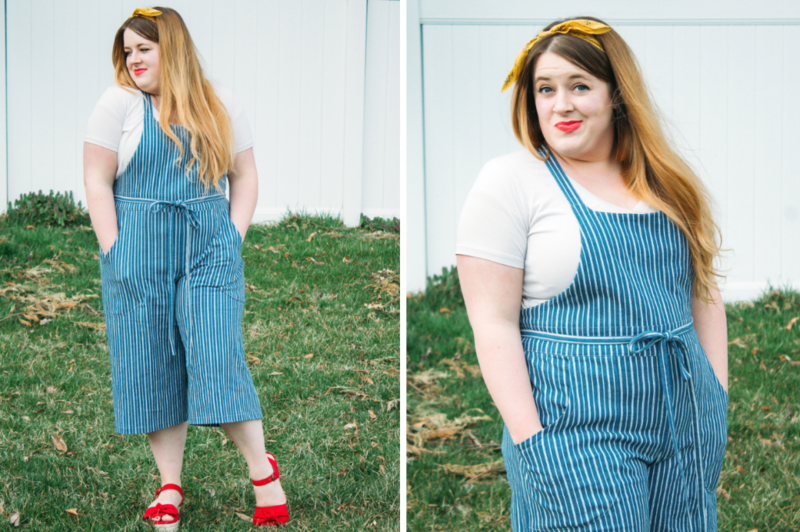 Spring seems to be the perfect overall-wearing season and we love Meg’s take on the Burnside Bibs! She paired our stripe denim with a vanilla jersey knit for a classic combination that she can enjoy all season long. And isn’t that extra pop of red fun?! Learn more HERE. 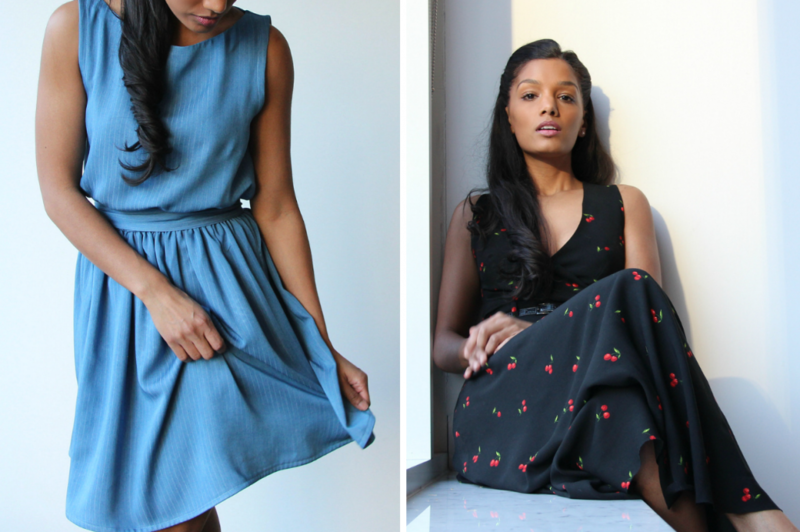 At the halfway point, Sharadha blew us alway with two completely different, but equally amazing, spring dresses. New to shopping fabric online, we won her over with these two beautiful rayons and did she ever do them justice. See lots more photos HERE. 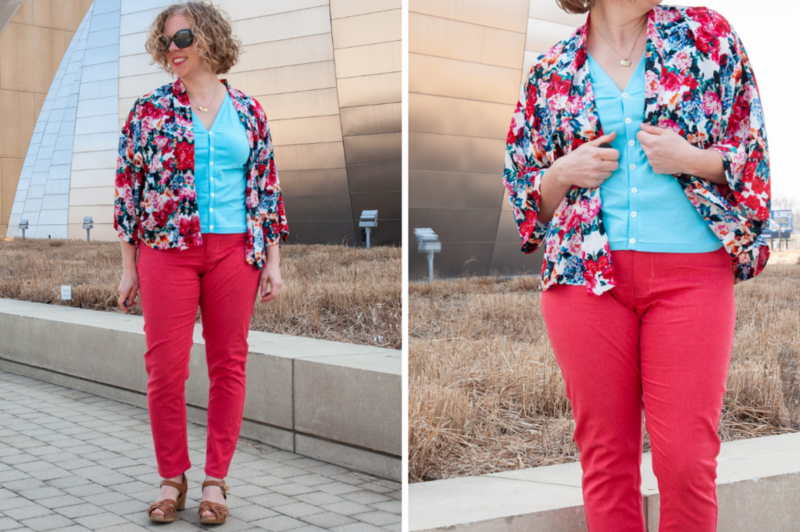 Katie, half of the Sew Altered Style duo, took spring color to the max with this amazing outfit! We are loving statement jeans this season and the coral denim Katie picked for hers is outstanding. Learn more about all three pieces of her outfit (including a teaser of their new pattern coming soon!) HERE. Drawing inspiration one of her favorite stores, Lori created two stunning pieces knocked her RTW-inspired look out of the park! We especially love her feminine spring top that beautifully combines a knit and woven. Get all the details about both pieces HERE. 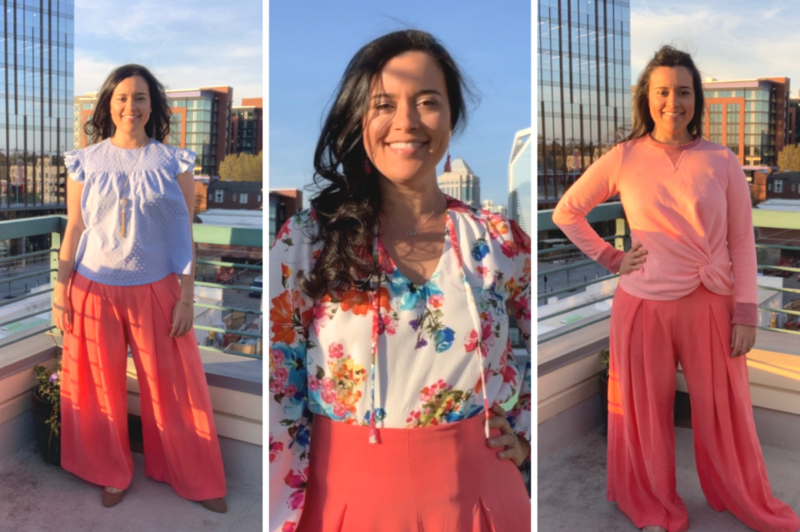 Using coral, the color of the year and our favorite color this season, as her inspiration, Lindsey created three unique looks with four stunning garments. Watch all three outfits in action in her video tour post HERE. She also shared three bonus videos with more details about the patterns she used, HERE, HERE and HERE. We were honored to have Jasika join us for our tour this spring and are totally in love with her “Starburst” dress. 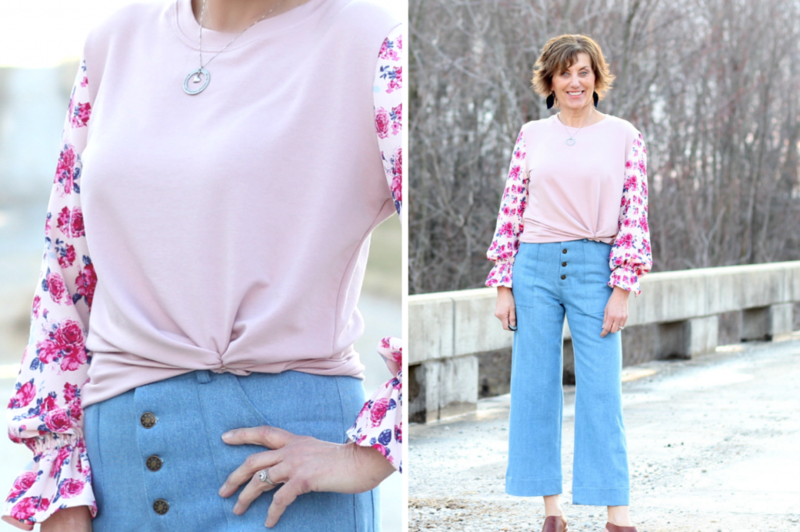 After much debate about her fabric and pattern choices, the three shades of Tencel twill she pick out work beautifully together and are the essence of spring. Read more about her choices and see lots more photos HERE. We wrapped up the tour right here on the Style Maker blog with another RTW-inspired look. 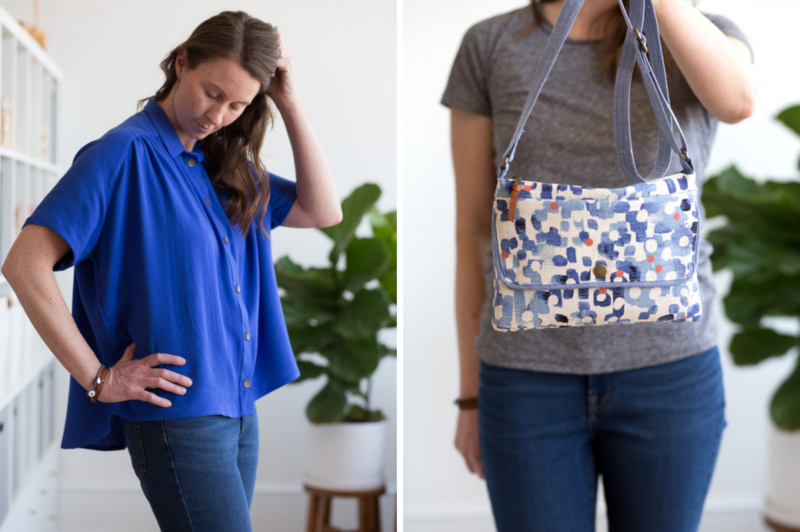 We experimented with two indie pattern on our must-sew list to create both pieces and we love the results. See the original inspiration and learn more about the patterns and fabrics we used HERE. That’s a wrap! Thank you all for following along with us for this spring’s Style Tour. We can’t thank you enough for helping us kick off another amazing season of sewing! We also want to give huge shout out and thank you to all the amazing seamstresses that took part in the tour this spring. You all overwhelm us with your creativity, skill and talent! Thank you so much for joining us! We hope the tour gave you just the jumpstart you needed for your own spring sewing! We’d love to see what you are making, be sure to tag you makes @stylemakerfabrics and #stylemakerfabrics on Instagram or Facebook! Thank you Elizabeth for joining us! Your outfit was a great way to help kick off a new season!